We're living in a golden age for tech, with new innovations and inventions appearing on a regular basis - so we thought we'd take a look at the status of a few inventions you may be familiar with from sci-fi movies but haven't yet seen while walking down the street. You can actually expect to see a lot of this tech sooner than you think, as artificial intelligence, materials science, and some of the brightest minds in the planet continue to drive progress. In other words, start saving up for that jetpack as soon as you can. The streets might not be safe for all that much longer based on some of the mech suits now in development - the sort of human-like, human-controlled robots that feature in Pacific Rim and Avatar and countless other sci-fi stories. Take this 13-foot mechanical exoskeleton currently being worked on in South Korea, which needs a power cable for now but which might soon be able to wander freely. It's not actually intent on giving its pilot superhuman powers though: it's designed for industrial uses such as disaster recovery scenarios. Putting these suits together is a huge technical challenge in terms of power, materials, and engineering design, but modern-day technology and know-how are starting to solve a lot of the problems. There's even a giant mech battle planned by MegaBots for later this year if you want to see two of these huge robots knock sparks off each other... and maybe get a glimpse into our apocalyptic future. 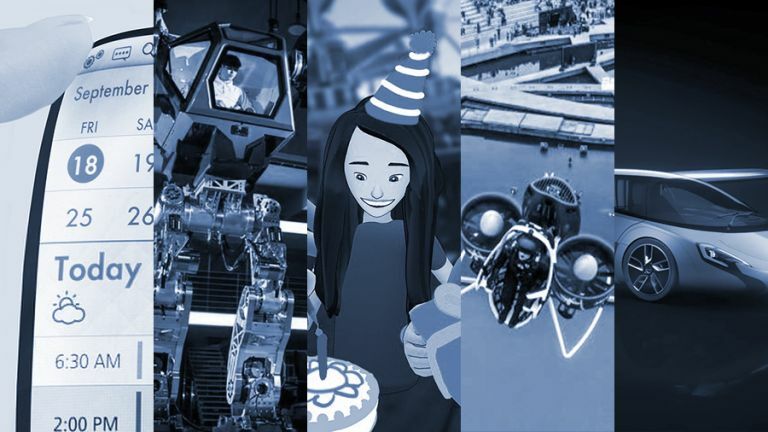 Admittedly Facebook Spaces, the VR environment recently unveiled by the social network, doesn't look all that enticing now - but the tech is developing fast, and in just a few short years we might all be spending more time than you think in virtual reality. For now the kit is expensive and the experiences mildly nauseating, but use your imagination and it's not difficult to see where this is going. Why would you want to stick around in normal, humdrum, run-of-the-mill reality when you can have an alternative reality perfectly tailored to your tastes and senses? That mansion by the sea really can be yours. If you're not convinced, go and watch The Matrix or Wall-E and get back to us. All kinds of companies are pushing forward in this area: from Facebook to Google to movie studios, and the quality of our digital universes is going to get better fast. Phone design might not have changed much in the last few years, apart from a trend for disappearing bezels, but a mobile you could fold up and put in your pocket would certainly count as a major innovation. For that to happen though, all of the various components and bits of circuitry inside a phone, from the screen to the battery, would have to be flexible. As far as screens go, both Samsung and LG are known to be working on displays that can be rolled up, at least partially. Apple supplier Japan Display Inc is also said to be starting production on a flexible display next year. Rumours have long been swirling about a Samsung phone that's fully flexible - the Samsung Galaxy X - and apparently a prototype model is now very close indeed, with one that you can actually buy arriving in 2019. Flexible could be the new norm in a few years. It feels like the dream of a flying car has been around for years and years, but are we actually any closer to driving off (and flying off) in one? Well, AeroMobil just opened preorders for its first flying car, so quite possibly. Before you trade in your existing motor, bear in mind that you won't get your delivery before 2020, and you're going to have to pay at least €1.2 million (about £1 million) when it's eventually ready go to. Oh, and you need a pilot's licence. The car/plane looks impressive though - a top speed of 99 mph on the road, a 161 mph cruise speed in the air, and a one-button conversion process that takes just three minutes. AeroMobil isn't the only player in the flying car game. The Terrafugia Transition looks much more aircraft than motor vehicle, but it will work on both the road and in the air, and production is slated to begin in 2019. Meanwhile the PAL-V Liberty takes more of a helicopter approach to the flying car concept, and like the AeroMobil, preorders are open now, with delivery promised for 2018. If you're of a certain age then you'll have wanted your own jetpack ever since Sean Connery took off in one as James Bond in Thunderball in 1965 - but this most futuristic mode of personal travel could well be almost upon us. Over the last few years more and more jetpack-style contraptions have been hitting the headlines, from the JB10 from Jetpack Aviation to the Flyboard Air. In fact, the JB10 is already on sale to a select few. Another jetpack on the verge of a full release is the Martin Jetpack, though for now (like the JB10) you have to go through a screening process to get your hands on one. It has a range of around 12 miles, can climb about a mile and a half into the air, and runs on the same sort of petrol you put in your car. It's going to take a while before jetpacks are actually legal to use and affordable - but in terms of the actual tech, they're almost ready.